Danielle Oceguera didn’t have plans to enter Mika Brzezinski’s Grow Your Value contest. She thought there was no way she’d even be considered. But after one of her mentors insisted, the 25-year-old talent development coordinator decided to give it a shot. And it’s a good thing she did, because on Saturday night, the Oakland resident won the grand prize: a $25,000 raise, which she said she’ll put toward her education. It was an exciting day for Oceguera and her fellow finalists, Jenny Nixon, 32, of Berkeley, Calif. and Jodee Brown,40, of Tracy, Calif. The trio spent the day alongside the more than 600 attendees at the Know Your Value conference, learning how women can recognize and be recognized for their personal and professional value. And at the end of the day, they took center stage in front of that audience to pitch their story to a panel of judges. Earlier in the day, Nixon stood in the nearly-empty ballroom at the hotel watching a video roll across the big screens documenting highlights of her experience as one of three finalists in the Grow Your Value bonus competition. “I’m so excited, I don’t even have words,” said Nixon. The MBA student at the University of California-Berkeley, who also teaches ROTC classes at the University of San Francisco, could barely contain her tremendous smile. Know Your Value Coaching Day Segment from Know Your Value on Vimeo. 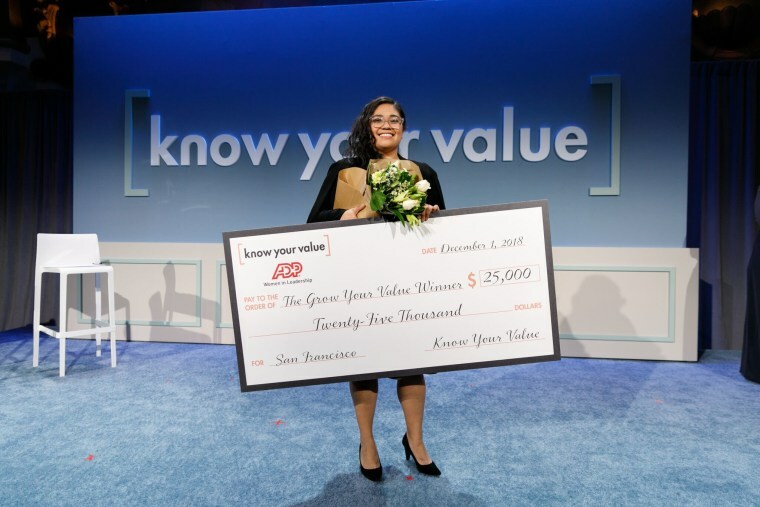 The three finalists were among dozens of women from around the U.S. who submitted short videos defining their value and pitching why they should be among the three to compete for the Grow Your Value bonus. Dia Simms of Combs Enterprises, Maria Black of competition sponsor ADP and NBC’s Natalie Morales served on the panel of judges that selected the winner. Oceguera’s fellow finalists also delivered powerful messages. Brown, a social worker, told her story of her harrowing experience as a young alcoholic mother fleeing an abusive relationship. Brown said her teenage daughter, Jordyn, was her primary inspiration for positive change. Jordyn attended the event alongside her mother. “I am no longer ashamed, and I pray my story grows wings today and touches everybody right when they need it most,” said Brown. When it was Nixon’s turn, she took charge of the stage, even asking “Morning Joe” co-host Joe Scarborough to step back and give her more space, before addressing Brzezinski directly. The women spent weeks preparing for their appearance at Know Your Value’s San Francisco event. As part of the experience, the three spent time in New York City working with a group of coaches and advisors, including body language expert Janine Driver, communications expert Chris Ulrich and Gravitas founder and CEO, Lisa Sun. The experts helped them improve their physical presence, hone their personal style and explore their values. Each of the women said they put the lessons from their New York City sessions into action almost immediately. “I was able to apply what I learned the next day,” Oceguera said. The time together bonded the three women as friends, not competitors. Brown, Oceguera, and Nixon each said they hoped the attendees walked away with a strong sense of their own value, the courage to pursue their dreams, and pride in their accomplishments.